The long-awaited T-Mobile G1 smartphone combines full touchscreen functionality and a QWERTY keyboard with a mobile Web experience that includes many Google tools you've come to rely on with your PC, including Google Maps Street View Gmail, and one-touch Google search. It's also the first phone to be powered by Google's new open-source Android operating system, which offers an intuitive interface easily customizable home screen. You can also purchase optional software via the Android Market to personalize your G1 with a variety of software applications like games, social networking, and on-the-go shopping. Just tap the screen and go with access to all your favorite Google tools. In addition to a vibrantly colorful 3.2-inch touchscreen, the G1's hinged screen slides open to reveal a full QWERTY keyboard and closes to prevent accidental dialing. It runs on T-Mobile's new and growing 3G network, and also offers Wi-Fi connectivity for surfing the web on your wireless network or at hotspots as well as Bluetooth for handsfree communication. Other features include a 3-megapixel camera for still photos, a digital audio player (and easy access to Amazon's MP3 store), an included 1 GB MicroSD memory card, and up to 5 hours of talk time. The T-Mobile G1 operates on GSM 850/900/1800/1900 networks and is compatible with T-Mobile's UMTS/HSDPA 3G network, which operates on the 1700/2100 MHz AWS spectrum. T-Mobile is currently rolling out its 3G network, and it expects by year's end that its high-speed data network will be available in those cities where a majority of its subscribers currently use data services. In those areas where 3G is not available, the phone will access data using T-Mobile's EDGE network, which is fast enough to support a wide range of advanced data services (with average data speeds between 75-135Kbps). This phone is designed to automatically connect to the best available network (3G or GSM/GPRS/EDGE) to provide faster data speeds when accessing the Web or downloading content from the T-Mobile t-zones content portal. Call your favorite people with T-Mobile's myFaves service, which allows you to call up to five of your most common contacts--on any network, even landlines--without using any of your minutes. You'll also get free domestic long distance and no digital roaming charges anywhere across the US on all calls. (All myFaves plans require a two-year contract.) Learn more about myFaves from T-Mobile. The T-Mobile G1 with Google is the first phone to run on the Android operating system, which provides easy access to a wide assortment of messaging tools and Google apps. Additionally, this open source OS empowers developers to to create and offer applications that add value to the G1. 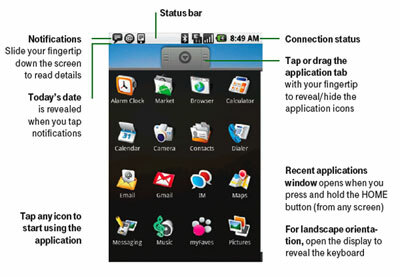 The G1's Home screen (seen at right) is your starting point for using all the applications on your phone. You can customize your Home screen to display applications, shortcuts, and widgets. Just drag and drop any of your favorite applications, photos, or folders onto your home screen for quick access to what you use all the time (see larger version). With the comparative shopping ShopSavvy application, you can scan the UPC code of a product with your phone's camera while shopping, and instantly compare prices from online merchants and nearby local stores. Ecorio was developed to help people keep track of their daily travels and view what their carbon footprint looks like. With access to tips and tricks, Ecorio allows you to record the steps you take throughout their day to help offset your impact on the environment. BreadCrumbz enables you to create a step-by-step visual map using photos. Create your own routes, share them with friends or with the world. Additionally, the T-Mobile G1 comes pre-loaded with a new application developed by Amazon.com that provides easy access to the Amazon MP3 digital music download store with more than 6 million DRM-free MP3 tracks. You'll be able to search, sample, purchase and download music from Amazon MP3 directly to the G1 (downloading music from Amazon MP3 using the T-Mobile G1 requires a Wi-Fi connection; searching, sampling and purchasing music can be done anywhere with a cellular connection). 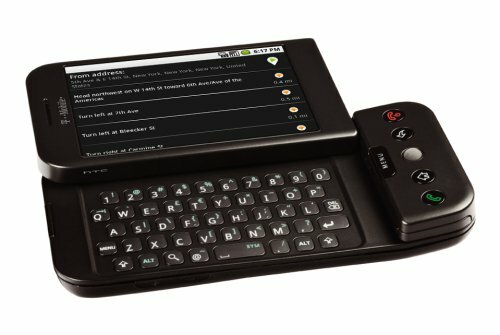 The T-Mobile G1's vibrant, high-quality screen slides open to reveal a full QWERTY keyboard, great for communicating with friends online or using the phone's email, IM and mobile messaging capabilities. As another option for accessing the device, the T-Mobile G1 comes equipped with a convenient trackball for more precise, one-handed navigation. 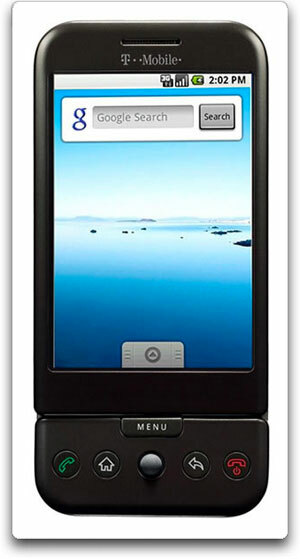 The 3.2-inch touchscreen has a 320 x 480-pixel resolution and a 65K color depth. The T-Mobile G1's touchscreen interface is unique, providing you with a more customizable, interactive touch experience. For example, you can set a signature gesture to unlock the screen (there are 30 million possible combinations). There are also different taps for different types of commands--for example, you can use a short touch to launch an application, or a long press on any screen will give you additional options, similar to that of a right click on a mouse. The phone has an internal 192 MB RAM/256 MB ROM memory, and it's expandable via optional MicroSD memory cards up to 8 GB in size (a 1 GB MicroSD card comes with the phone). The hinged screen slides open to reveal keypad and closes to prevent accidental dialing. With one-click contextual search, you can search for relevant information in a flash with a touch of a finger. A full HTML Web browser allows users to see any Web page the way it was designed to be seen, and then easily zoom in to expand any section by simply tapping on the screen. Built-in support for YouTube allows you to enjoy YouTube's originally-created content, easily navigate through YouTube's familiar video browsing categories or search for specific videos. With Google Maps, Google's groundbreaking maps service, you can instantly view maps and satellite imagery, as well as find local business and get driving directions, all from the phone's easy-to-use touch interface. The T-Mobile G1 also includes Google Maps Street View, enabling you to explore cities at street-level virtually while on the go. Without taking a step, you can tour a far-away place as if they were there--standing on the street corner. Even better, the Google Maps feature syncs with a built-in compass on the phone--an industry first--to allow you to view locations and navigate 360 degrees by simply moving the phone with your hand. Use the G1's 3G and Wi-Fi connection to attach and share pictures over email and MMS or download music from your favorite web sites, as well as upload and post pictures to your personal blog. The G1 features a rich HTML email client, which seamlessly syncs your email, calendar and contacts from Gmail as well as most other POP3 or IMAP email services. The Gmail application provides features such as conversation view, spam filtering, search, and labels that Gmail users enjoy on their computer while offering new features such as integration with the phone's contact list. And it multitasks, so you can read a Web page while also downloading your email in the background. It also combines Instant Messaging support for Google Talk, as well as AOL, Yahoo! Messenger and Windows Live Messenger in the U.S., and IM presence allows you to see whether your friends are online, offline, away. The G1 also supports advanced text messaging features, enabling you to easily flag, delete or move groups of messages and keep track of group conversations through threaded text messaging. The Google Calendar app on the G1 syncs with the Web-based version, so any event that you add to your phone will show up on the Web-based Google Calendar (and vice versa). The T-Mobile G1 with Google weighs 5.6 ounces and measures 4.6 x 2.2 x 0.7 inches. Its 1150 mAh lithium-ion battery is rated at up to 5 hours of talk time, and up to 130 hours (5+ days) of standby time. It runs on the 850/900/1800/1900 MHz GSM/GPRS/EDGE frequencies as well as the 1700/2100 MHz HSDPA 3G frequencies. Q: Do you have to have a Google account to use T-Mobile G1? A: Yes, customers must log into the phone using a Google account login when they first use the device. Once you do log into T-Mobile G1 using a Google account, your Gmail and Google Calendar will all sync to your phone providing secure, up-to-date access to your personal information. If you don't already have an account, the startup process will walk you through creating one. Creating a Google account is free. Q: Do customers need a voice and/or data plan to use T-Mobile G1? A: Yes, when you purchase T-Mobile G1, you must add one of two T-Mobile G1-specific data plans to their account. 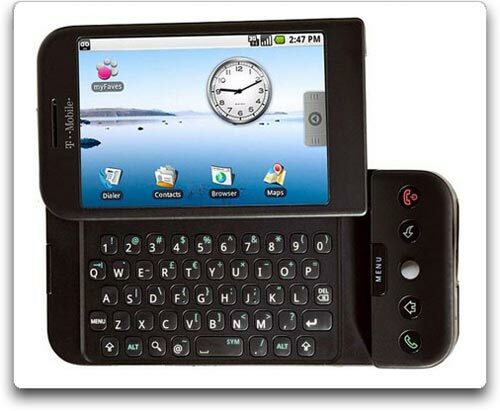 This is similar to other all-in-one devices we offer like the T-Mobile Sidekick or the T-Mobile Shadow. Customers must also have a voice plan. Q: Is the G1 compatible with your HotSpot @Home service? A: No. Unlimited HotSpot Calling (formerly named T-Mobile HotSpot @Home) is not included in the T-Mobile G1, although the device can browse the Web over high-speed wireless connections including Wi-Fi and our 3G network. Q: Are there any advantages to using Gmail on the device versus another type of personal (POP3 or IMAP) account? A: Yes. After first logging into their Google account, you will have all your Gmail, Google Contacts, Calendar and Talk data automatically synchronize with the phone. Anything you do on the phone with these products will seconds later become available on the computer and vice versa. If you were to ever lose their phone, their information will still be available and seamlessly synchronize with a replacement G1. You will also benefit from push email and calendar alerts (this is also available for the multi-headed email client). Finally, Gmail's contacts are synchronized automatically with the phone's contact list. Q: What is the "search from everywhere" feature? A: "Search from everywhere" provides customers the ability to do contextual searches. T-Mobile G1 has a hard key on the QWERTY keyboard that you can touch in order to start a search within any application you are in. For example, if you are in your contact list and hit the search key, the device will search your contact list. If you are in your email and you hit the search key, the device will search your email. You can also start a search within each application through a search option within the application. I was one of the first people to own it - I ordered it through T-Mobile one month before the official release date and had to wait all that time wondering was it worthy to prepay $200 for a totally new product with a brand new operating system - Android. The answer - Yes. It was well worth the wait and the money. I received it 2 days before the official release date - October 22nd, 2008, on the 20th, and have been using it since. It has been 6 months now and I have accumulated lots of experience with this phone already. The G1 has far exceeded my expectations. It is a great phone, a smart phone, a multimedia player, a gadget with always updating software, firmware, applications and features, and a great easy to use operating system. The Android operating system is designed and created by Google and is used for the first time here on this G1 phone. It works almost flawlessly, but like any other computer or smart phone after a long period of using, it needs to restart. So from time to time turn off your phone, and then turn it back on, and it will work like new. The best thing about Android is that it allows developers to create new Applications, update them, release a free or a paid or a test version of it in the Android Market. The Android Market is something like the T-mobile tzones, but only for the G1 phone (currently), where you go and download applications and games, or update them. You can also comment on already downloaded apps, or e-mail the developer for questions and suggestions! So far there are hundreds of free apps already released in the Android Market, yes, they are free. There are some paid apps too for prices between usually $0.9 to $5.99. Most of the apps you can find on the iphone, you can find on the G1 Market too, and for free. There are also lots of mobile comic books, regular books, apps for smart or funny quotes, translators, converters, stopwatches, business apps, and lots of games, most of them free. The phone has only 1GB memory, but you can add a MicroSD card. I added the 8GB MicroSD and that seems enough. Currently the apps can be installed only on the internal 1GB memory though, which is a downfall because sooner or later this 1GB will reach its maximum. Also all your e-mail and browser history are saved on the internal memory. Despite the small internal memory (1GB) there are no other downfalls. Some people suggest the speaker is not loud enough, but they must be deaf. I compared it with other phones (my friends') and it was either the same or louder. The touchscreen is very nice, easy to use, with a desktop with 3 pages. You can slide to the left or to the right. You can place icons of your favorite apps on any of the 3 desktop pages for faster access, or you can use the full app menu. 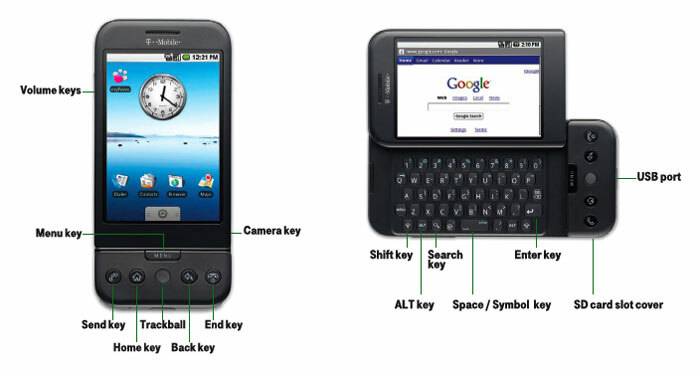 If you don't like using the touchscreen, the G1 offers the so called "Track Ball" located on the bottom part of the phone in the middle between the other buttons. You can scroll and move through the screen and different apps with this ball, also when browsing the internet and want to click on a link. You can press the track ball inward for choosing or clicking. You can also open the keyboard and use it. You will need to do that when writing an e-mail or a text message. The keyboard is QWERTY and is very easy to use, it lits and is visible when dark. The phone has the 3 main internet functionalities: EDGE, 3G, and wifi, and also it has gprs. It supports GPS, but not full real time GPS (it does not tell you turn left, right, and so on). You can easily switch between using the wifi, or 3G. I recently started using just EDGE and it is almost as fast as 3G. You need 3G or wifi, when using heavy apps, which require it, or when you need a fast download of a big file, otherwise you can use just EDGE, and that makes your battery last longer too. Keep in mind that the more users use 3G the slower it gets for everyone, and that is true for all carriers, so you have the alternative to either switch to wifi or EDGE. Some people suggest that the battery doesn't last long, but the G1 is considered a smart phone and as such has a very decent battery life. I charge it every night, and it lasts me the whole next day, considering I talk an average of 1 hour a day, I constantly check my email and browse the internet, I use the apps constantly, and I often text message. If the battery life is not enough for you just buy a car charger and an extra battery. Keep in mind that the G1 phone can replace your laptop or netbook, and one of those usually lasts only 2 hours! It also has a bluetooth feature for attaching the phone to a bluetooth device, or you can attach a regular hands free head set (included in the box). It has a great 3 megapixel camera, but no flash. It does great photos during the day (use the app SnapPhoto which has Image Stabilizer), but not during the night, which is normal for cell phones. There is a new app just released for taking video (unavailable on the iphone) called "Video Recorder" but it doesn't work very well yet and is a little buggy (the developer is working on an update). But hey, this is a cell phone. If you need to take good quality photos and video just buy a Canon digital camera. Here I am going to mention the Google integration. It is everywhere. You can use google maps to find a location or for directions. Also many developed apps are connected to google maps. You can use google lattitude too. There is great google e-mail app called "Gmail", and I recommend you create a google e-mail account if you don't have one, but you can use any other e-mail service too (Yahoo, MSN, AOL, etc.). The best thing to do is use a google mail account via the Gmail app, and your other e-mail via the regular e-mail app called "Email". You can also download the Picasa app and browse through your photos uploaded online. Last I am going to mention one great G1 innovation (at least I haven't seen it anywhere else) - the "Chat" style text messaging. All messages with the same person show as a chat and you can easily scroll up and see their (received) and your (sent) messages in the order they were received/sent. This is so cool, you gonna love it! Overall this is a great cell phone / smart phone! Compared to its biggest rival - the iphone - I think it beats it by a mile, because the G1 offers a QWERTY keyboard, a Track Ball, Free Apps in the Android Market, Google Integration, "Chat" Style Messaging, and it offers everything the iphone offers. I personally dislike Apple products including the iphone because they will try to do anything to make you use their products and services only, and no other. For example they will try to make you use itunes only, and make you download all songs through itunes and make extra money that way. It is not easy to download a song on the iphone not using itunes, all of you know that. I know many people who have the iphone. Also the iphone doesn't have a card slot. The G1 offeres all kinds of ways for listening to music, or watching video, browsing the internet and all other mobile services via numerous (different) applications, and is open to any developer to add a new application of the same kind or create a totally new idea. All this makes the G1 much better phone than the iphone. I bought this phone the day it came out because it is the first open phone produced. I like the phone as a phone. It has good sound quality and good reception. It also has a touch screen, a full keyboard, GPS, plays MP3s and videos, has a movement and tilt sensor, and a decent camera. The software available after just one month is cool, and best of all - free. I especially like a freeware (locale) that uses GPS to figure out if the phone's ringer should on and off, and who should be allowed to "ring through", and when. The weakest point of this phone is that, with all the features turned on, the battery only lasts about five hours. I'd gotten a Blackberry Curve because I wanted to get the Internet features. I hated the mobile version of most websites, though, and kept putting off going through the manual to learn the phones more advanced features. Then I lost my Curve and replaced it with this. SOOOO much better. Once again, I've barely looked at the manual, but this time it's because the phone is so easy to figure out. I do wish it were smaller, but it still fits decently into my front jeans pocket. You probably ought to go to a T-mobile store and hold it in your hand before deciding to buy it. I'm very happy with my G1. I pre-ordered it from TMO last October and have been happy with it ever since. I'm already very google-centric, using Google Calendar, Gmail, and numerous other free Google products for what I do. So having a phone which pulled it all together on a simple device makes me very happy. I like the slide-out keyboard. It feels sturdy and not like cheap plastic like most other phones i've had. The person complaining about the Trackball obviously has a defective phone. I've had the phone for months and haven't had the symptoms he's whining about. That guy is also comparing the Sony Xperia (a $900 phone) with the G1 at half the price. The apps are very useful and nice. SnapTell and ShopSavvy actually save me money. I use Moxier and TouchDown to get my exchange emails. I use imeem, lastfm, and streamfurious to listen to music at work. After the latest upgrade, the Camera functions as well as any other camera phone with focus. Google Voice search has been great to use on the road and when I can't look down at my phone to search for something nearby. It already has Google Maps well integrated into the phone, but the last major thing I think it needs: turn-by-turn GPS is coming to the phone on the 24th of February. As a gadget, it's neat. You can scan product bar codes and see what stores nearby or on the net sell those items. It has a camera for pictures only. Quality is OK. The OS is so-so. It does not allow you to manage memory or running applications. If you have a lot of applications open, the performance gets sluggish. My unit kept crashing rendering the browser unusable. This can be fixed by resetting the entire unit. As a phone, it still has some work left to do for the next version. You can't easily operate it with one hand. Since it synchs with your google contacts you will most likely need to scroll through hundreds of contacts and cannot type in names to narrow down the search - like a blackberry. Typing on the keyboard is awkward. The trackball prevents the right hand from getting a good hold while typing. Researching smartphones, picking the G1 seemed risky. The lack of MS Office integration, the newness of Google in this market, the mixed reviews and comparisons to iPhone or Blackberry products, my happiness with my current service provider (Verizon), all made choosing the G1 worrisome. Mostly out of curiosity, and the inexpensive commitment involved in making the experiment, I was sold after playing with the G1 in a T-Mobile store. The ease of use and intuitive design made this a quick winner. In the past 4 months of ownership, I have fallen in love with this odd little phone. I love the quality of call sound (inbound and outbound), having a full querty keyboard, Google's integration services (especially saving SMS in GMail, managing contacts online, and voice search), and the ongoing array of amazingly useful free applications (compare prices on an item by taking a photograph of it, recognize songs, send GPS coordinates to friends via text message, manage finances, et al). Some room for improvement would be the camera interface (and lighting), sensitivity of the touch screen, improved file management system, integration with MS Office products (or Open Office), and better ability to alter phone settings through Google.com. I've subscribed to T-mobile for a long time, suffered with the early HandSpring Treo 180 fiascos and associated class action suit over broken plastics. I wasn't expecting iPhone perfection on the first release, and I'd say it's about 80-90% of what the iPhone user experience is. Since I won't switch to AT&T, I'm content. - Android marketplace reviews are of low quality (needs a 'was this helpful?' link like Amazon's reviews), or the reviews need to be based on multiple dimensions, like "UI quality" and "app stability"
T-Mobile G1 Phone with Google is Excellent! Its not a matter of size - just how you use it. I have had this handset pretty much since its first week of release. I will start with a review of the size itself. The phone was in consideration by me as a result of it having a slide-out keyboard. I do not like the virtual keyboard, and to be honest - the size is not nearly a big deal as everyone says, its about the same thickness as a deck of cards, and really has a great interface for being the first version of the phone and OS. the Operating System originally was very sluggish and had a hard time updating email and contact lists.. and the browser took a few longer seconds to load. As of about a week ago, the phones are now updated. Mine updated itself and after that, the sluggish-ness pretty much lessened to un-noticeable and even the battery life was extended, as a rsult of the phone not draining so much power using applications. It seems and feels a bit more streamlined. I do not like at&t's service or customer service.. i would have liked an iPhone but again, I don't care for the virtual keyboard. I really love my G1. I only gave it 4 stars because the customer service at T-MOBILE is ridiculous as well. They outsource like many big companies, and half the time I have to re-explain myself to 3 or more different people because the operator doesn't know what I am saying. I would give this phone a shot.. or wait till verizon has their Android phone on the market later this year. Excellent browsing, good battery life, and I absolutely adore the slide-out keyboard. Really neat phone but....the applications are limited to whatever android (the operating system) adds for you to use. The main problem is that they do not have adobe flash player on the phone and without that most of a websites additional features don't work. You could save your money and get a less expensive phone which does about the same. I also would like to see MLB Gameday ( live baseball) which the I-Phone has and since they (android.com) haven't developed the application for T-Mobile g1 phone I'm at a loss.